Kenya is a country made up of many different tribes and thus there are numerous customs and traditions that exist there. Though they differ slightly depending on the tribe or region of Kenya, there are several “staple” foods that most Kenyans eat. The most common of these Kenyan foods is ugali. Ugali is made with maize flour and water, and when it is finished cooking, it becomes a spongy, white substance that is rolled up with your fingers and then mixed with greens or stew. 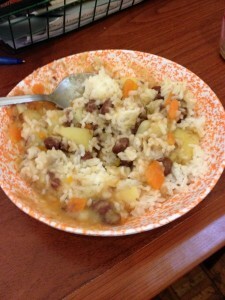 This is a great meal option for all Kenyans because it is fairly inexpensive and easy to make. A more expensive, but popular staple food in Kenya is rice. Rice is paired with most anything – beans, vegetables, meat, stew, or lentils. A special favorite is “rice pilau” in which spices are added to the rice along with chunks of meat. The most popular meats in Kenya are goat, sheep, chicken, fish, and beef. Beef is the least expensive meat available and Kenyans usually don’t waste any part of the meat, like us Americans do. Nyama Choma is an especially popular type of grilled goat meat that is often served in restaurants. Chapati is another favorite among Kenyans. This is a tortilla-like flat bread made with water, flour, oil, and salt. Some cannot afford to eat chapati often, so it is a special treat whenever it is made. Chapati is also usually a favorite among P82 teams who visit Kenya. As far as beverages go, Kenyans are known for their love of chai—which is not the same as “chai” in America, but is the word for tea in Swahili. It is very rare to go to a meeting or to visit someone’s home without being offered chai. Chai is usually made with fresh cow’s milk, water, sugar, and tea leaves which are grown in Kenya. Coffee is grown in Kenya also, but it is usually exported and is not nearly as popular as chai. Most parts of Kenya are very fertile, so vegetable gardens are common. If you do not have your own garden, outdoor markets and fruit/vegetable stands are many, so you will almost always be able to buy cabbage, greens, potatoes, tomatoes, onions, carrots, peppers, garlic, bananas, oranges, avocados, mangoes, etc. Some unexpected food choices in parts of Kenya include termites and cow’s blood. When it begins raining in Kenya, many termites emerge. They are often caught and fried for a protein-rich treat. The Maasai tribe is traditionally known for consuming cow’s blood by either mixing it with milk or drinking it alone. They do this during special occasions or rituals and believe that it makes a person healthier and stronger. Although Kenyan food does not offer the variety that we are accustomed to in the United States, it is delicious, fresh, and nutrient-rich! Kenyan women take their young children with them wherever they go, as access to babysitting or daycare are pretty limited. 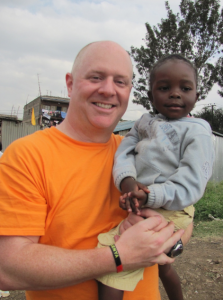 We try to take the babies out of the house as often as possible to have them experience what it would be like to grow up as a typical Kenyan baby. We also see that it is important for each baby to get one-on-one time with an adult caregiver whenever possible. 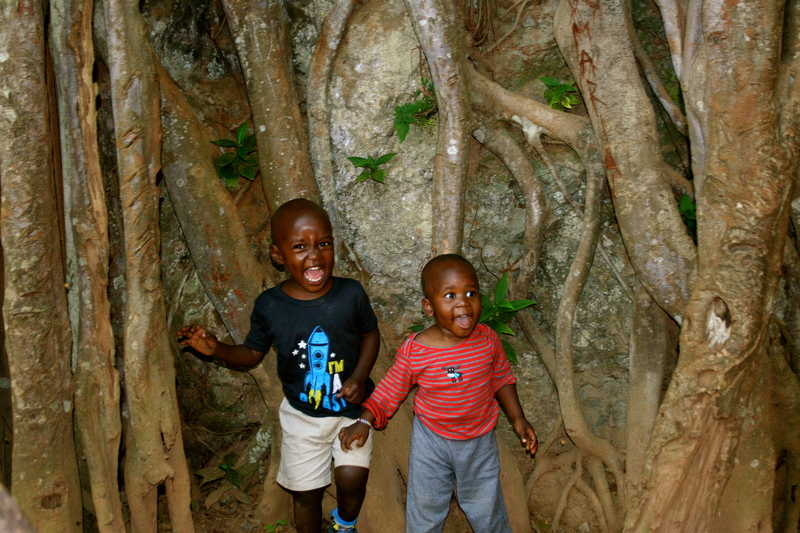 Most weeks, this is a trip to the grocery store or even just a ride in the car, but this time it was Caleb and Hassan’s turn for an outing, and we treated them to a morning of exploring at Paradise Lost, a nearby tourist attraction with caves, a waterfall, and boat-riding. They had SO much fun!! Just look at their smiles! Please help us celebrate Christmas with our children and guardians. A contribution of $38.00 (one additional month’s sponsorship), will assist in purchasing a new backpack for a child, some school supplies, a new school uniform, an additional set of clothing and new shoes. You can make your contribution on our webpage by clicking DONATE and designating Christmas in Kenya, by mailing a check to Project 82 Kenya, P.O. Box 680003, Marietta, GA 30068, or by calling our office at 770-977-7114. 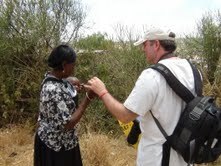 As I reflect this day, World Malaria Day, I cannot help but consider our children in Kenya. Malaria in Kenya is an everyday occurrence, and it strikes predominately in rural areas with the greatest burden falling on lower income families. 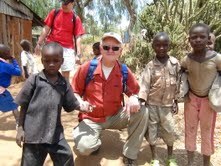 One of the wonder’s about the work that we do is that we are faced with situations in which our children in Kenya are struggling with diseases and circumstances that we fix here in the United States thousands of times a day. Malaria is just one of these examples, with hundreds of thousands of individuals suffering in parts of Africa, and next to zero cases in the United States thanks to vaccinations and good hygiene. Malaria accounts for 20% of hospital visits in young children and pregnant women. The United States has long recognized this danger and has for many years partnered with the Kenya government to help eradicate this disease. Averaging approximately $80 million a year, the U.S. has worked alongside the Kenyan government as a part of the U.S. Global Health initiative and a four part plan. The strategy is both to control the spread of the disease by controlling the mosquito population and reduce the risk of mosquito bite for the people of Kenyan. Our children, Those we care for, and that you support and love have rarely seen this disease and are protected by sleeping under mosquito nets and spraying for mosquitos. Another element of healthcare your support provides coupled with semi annual thorough medical exams. 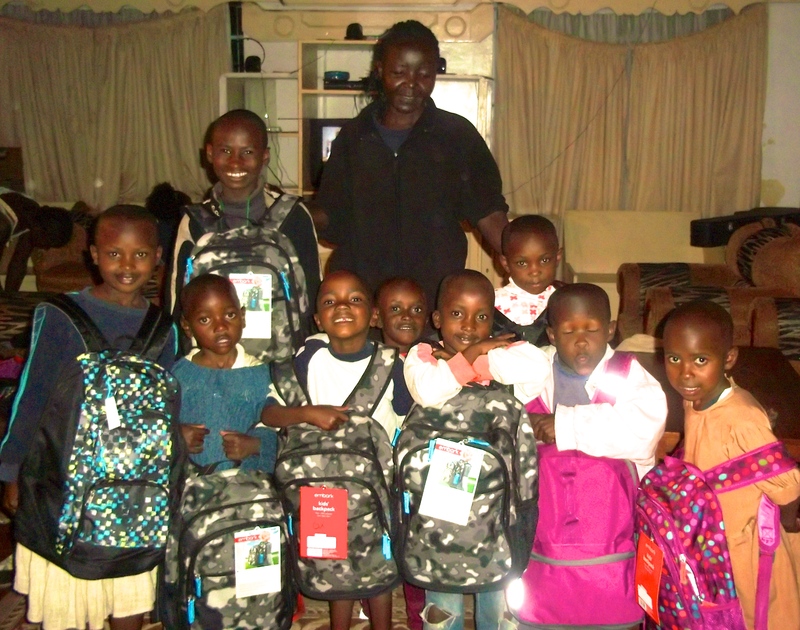 We thank you for your commitment to the children of Kenya supported through Project 82 Kenya. You truly are a part of a much larger movement. One that is saving lives, ensuring healthier living, enriching the children’s spiritual growth, and providing education which opens the doors to the future. We flew early from Maralal to Masai Mara, known to many as home to the Serengetti and the Great Migration of wildebeests, zebras and gazelles that occurs annually. During the flight from northern Kenya to the southwest corner of the country, we saw the awesome beauty of Gods creation from dusty dry bushlands, to rich farm lands of the rift valley, the great Abedere mountains and the plains of southern Kenya. Then upon landing in Masai Mara we traveled 30 minutes into the park and saw lions laying in the cool grass in the shade of a tree. It is very unusual for lions to be seen during the daytime. We have had the incredible honor to see lions, elephants, gazelles, elon, antelope, leopards, cheetah, vulture whose wingspan exceed 6 feet, giraffes, wildebeast, warthogs, jack rabbits, water buffalo, jackel, hyena, and guineas. Birds where God has beautifully painted their wings with colors that seem to be unknown. We witnessed elephants circling and protecting their babies from imposing onlookers. 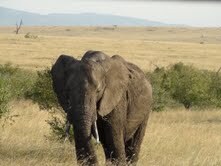 Beyond the beauty of the animals, to simply take in the massive land expanse is overwhelming. Everywhere you look, one wants time to stop momentarily so you take in all there is to see. One wonders how God created such a wide variety of plants and animals. In the midst of this incredible national park lives a tribe of people whose culture has barely changed over hundreds if not thousands of years. The Masai people where the bright red colors of their heritage. They are known for their skills in hunting and as warriors. They dress in elaborate bead necklaces and jewelry. Their homes are made of sticks and animal waste. Their young men are mentored to become hunters and warriors. This tribe of people seem to be unaffected by the politics of their country and our world. God’s presence in our lives remains as constant as the Masai heritage. His love is beyond the great horizons of the Kenyan sky. His creation is beautiful and innovative as the animals in His kingdom. His face shines upon us every day just as the sun rises and brings life to this earth, we are so very blessed to be able to see, hear, smell, touch, and feel all the beauty around us. Thank you, great Father. What an amazing experience flying to Maralal. Ben sat in the jump seat and assisted the pilots. Great job Ben! We landed in Maralal, were greeted by locals and Samburu tribesmen. We arranged Samburu guards for the plane and traveled the rough roads into town. It was fascinating to see the Samburu tribesmen, warriors and women engaged in conversations among friends along the road. We visited Springs of Hope orphanage where we played with the infants and toddlers who were home and visited with Grace and the nannies. 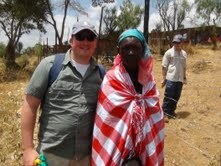 We went into town, purchased bread and bananas then arrived at Loikas, the slum area of Maralal. As we entered the area you could hear the word spreading, ” ‘Muzungos are here, muzungos are here.” we shared the bread and bananas with hundreds of children. They came to us with torn clothes, no shoes, filthy and very hungry. Yet they smiled, held our hands and walked alongside us. 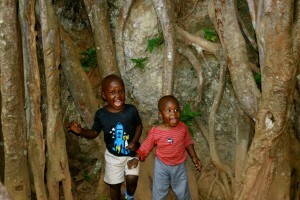 Our team began discussing the obvious absence of men in the towns, at orphanages and in families. As we were distributing the Bibles to the children of Springs of Hope, 5 men were standing near the fence watching very carefully. We happened to have a few Bibles left over and Hugh gave them to the men. They immediately sat down by the fence and began looking and reading the Bibles. Several men on our team went over and immediately began sharing Gods love with the men. They talked for over an hour. It was amazing to see these men of two very different cultures sharing Gods word. As usual, we think we are called to minister in a specific way, and as only God can do, His vision is so much broader and deeper than we can even imagine. Trent closed our day with an outpouring of his heart during devotion. He touched each of us and challenged us to pray for the men of Kenya and for them to embrace the Biblical principals for men as head of the households and owning the responsibility of their families. It began as a normal January day. The office was churning about, hustling to complete the year end financials. There was a knock on the door, followed by a P82 patron and her daughter Virginia. Virginia is a beautiful, young lady with a smile that can light up a room. Virginia’s mom stated that young Virginia had something she wished to share with us. Virginia, smiling brightly and holding an envelope timidly began telling us her story. “I had been saving my money for an American Girl doll. When we were in church and learned about the children in Kenya I told my mom and dad I wanted to do something for those children. I continued to save my money,” Virginia told us. “Then on Christmas, Santa brought me an American Girl doll and a note that said I could give all the money I had saved to help the children in Kenya.” Her bright eyes sparkled and her face radiated joy. You could feel the love in her heart. Needless to say, this led us to tears. 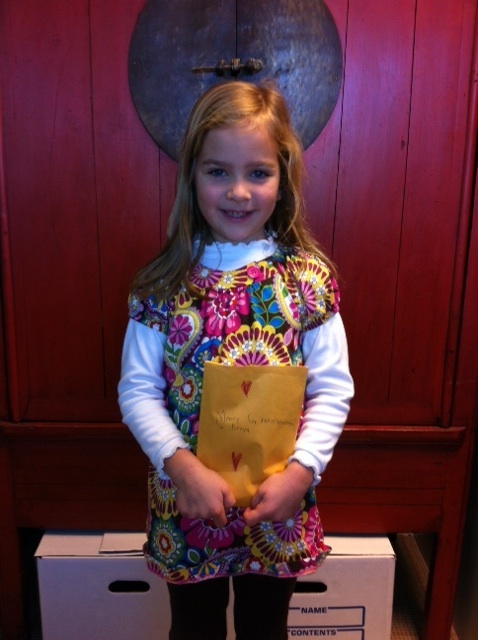 Our hearts were warmed and overwhelmed by the generosity of this young child. Virginia’s gift of $114 will feed three children in Kenya for a month. It is indeed a beautiful world God has given us when one child can make an extraordinary difference in the lives of three children whom she has never met. What is equally beautiful is Virginia’s gift to those of us around her. Virginia reminds us that God has enabled each and every one of us with the ability to make a difference in His world. As adults, sometimes we get caught up in the day to day demands upon our lives. We can end up feeling like we ourselves aren’t enough to make a difference, and can then end up not doing anything. Virginia reminds all of us that it is not about grander and big overwhelming changes, but rather taking one step forward and helping one child at a time. The entire P82 team is extremely excited to share the story of this wonderful young girl with our children in Kenya. Our children in Kenya love to learn about our families, our homes and how we live. They will be so very touched by Virginia’s selfless gift. Oh, the things our children teach us……..